More than 40 Belmont students and faculty members participated in the Nashville Tree Foundation’s ReLeafing Day on Saturday, November 18. Students from many groups across campus participated including First Year Seminar and Environmental Science Service Learning courses, the ECO club, Pembroke Hall, Kappa Psi Pharmacy Fraternity and Bridges to Belmont. The annual volunteer event is held the Saturday before Thanksgiving and provides an opportunity for community members to plant trees throughout Nashville as a way to participate in conservation efforts. This year’s event was hosted at Croft Middle School. Throughout the day,volunteers helped plant more than 300 trees at 10 Metro schools and neighborhoods across South Nashville. 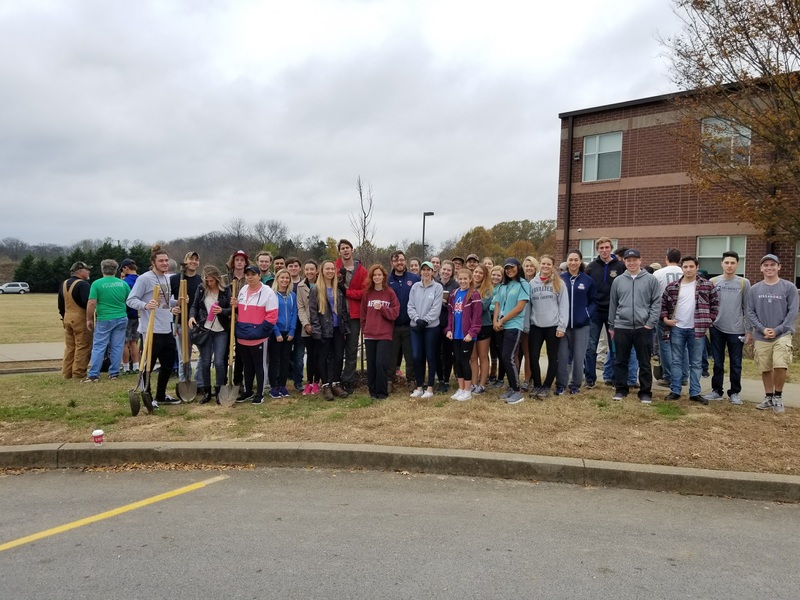 Belmont students participated in plantings at Haywood Elementary School, Wright Middle School and a variety of neighborhood houses in South Nashville. For more information about ReLeafing Day, click here.